Bridgetown, Barbados – June 18, 2014 – The BOA is issuing a call to action for all Barbadians to celebrate Olympic Day 2014 with a fun afternoon of activity at Trents Playing Field, Holetown, St. James this Sunday, June 22. Bridgetown, Barbados – In just 14 days, the Glasgow 2014 Queen’s Baton will arrive from Guyana, the 42nd of its 71 Commonwealth destinations. Barbados will provide an integral link when it welcomes the baton as it travels on one of the most engaging relays in the world. Today the Baton is currently travelling through St. Helena (an island in the South African Ocean). Public relations companies and communications consultants are often faced with moral dilemmas. In 2006 I was the proud recipient of a driver’s permit. However, at 2012 I am not the proud recipient of a license. How pathetic, some may say, but I guess in my mind it was something I could always get and I kept on putting it off. Have the young people in our society forgotten their manners? The first thing we are taught is how to address someone in authority. Even within a small communications company, communications can be ineffective. My boss always says “come on, we are selling communications we must be able to do it ourselves effectively every time.” Of course this is not always the case because effective communications is not simplistic. As human beings we communicate with every inch of our being and sometimes our intentions and what we communicate do no not match, there is a disconnect. Emails can be worst, as what we write may not be interpreted in the way we intend. One of the most demotivating and demoralising experiences in any working environment is dealing with a moody employee, be it your boss or a co-worker. Sometimes it seems as if they are directing anger from their personal lives toward you. Kingston, Jamaica, September 3, 2012 - Citi Foundation, the Caribbean Microfinance Alliance, and the Multilateral Investment Fund (MIF) are pleased to announce the winners for the 1st annual Citi Micro-entrepreneurship Awards for the Caribbean. The Awards recognize a microfinance institution and a micro-entrepreneur that have each demonstrated remarkable success in the English-speaking Caribbean. Five finalists were chosen for each award and a jury of six experts on microfinance and micro-entrepreneurship in the region has selected the winners. The winner of the Excellence in Microfinance Award will receive a cash prize of US$10,000 and the winner of the Excellence in Micro-entrepreneurship Award will receive a cash prize of US$3,000. Both winners will also receive a short video on their business or institution, an award certificate and a trip to the award ceremony at the Caribbean Microfinance Forum IV in Bridgetown, Barbados on September 30, 2012. Access Financial Services has established itself as one of the premier providers of loans in the Jamaican microfinance sector, serving 5,599 active Business loan clients through its fourteen branch island-wide retail network. Founded in 2000, the company was successfully listed on the Junior Market of the Jamaica Stock Exchange by 2009. Access has prioritised “working class entrepreneurs” as a key market segment and consistently provides convenient and innovative loan products for this segment. Despite a challenging economic environment which saw a 1.1% decline in Jamaica’s Gross Domestic Product, in 2011 Access recorded a 35% increase in the number of loans disbursed. In 2008 Javier Basto began frying plantains in his backyard and selling them to friends and neighbors in affordable US$0.50 bags in Guinea Grass Village, Belize. From that humble beginning, his plantains gradually gained popularity for their unique and tasty flavour, and he soon expanded with financing from La Inmaculada Credit Union for equipment and improved facilities. The Basto & Sons product line now includes cassava chips and churros (a fried flour-based chip) and is sold to grocery stores in Orange Walk Town, Corozal Town and Belize City. Sales have risen quickly from US$39,000 in 2009 to US$68,250 in 2011. Mr. Basto now has 7 employees and sells 5,000 bags per week with a goal of expanding to 7,000 bags per week. “The microfinance institution finalists demonstrate professionalism, innovation and above all, dedication to their clients, as they achieve success in Caribbean marketplace. By helping their clients grow their businesses through loans, training and other services, these institutions are fostering economic development in their communities,” said Tomas Miller, MIF Access to Finance Unit Chief and Awards Jury Member. “All of the finalists for the micro-entrepreneur award started off with just an idea and a small amount of capital to start their business. They are engaged in diverse activities such as baking, farming and retailing, and in just the past three years, most of them have more than doubled their annual sales. Through remarkable drive, ingenuity and hard work, these entrepreneurs have overcome challenges, expanded their business, hired new employees and helped to improve their respective communities,” said Winsome Leslie, MIF Senior Specialist and Team Leader for the Caribbean Microfinance Capacity Building (CARIB-CAP) I and II programs. The Citi Micro-entrepreneurship Awards will be presented at the Caribbean Microfinance Forum IV in Bridgetown, Barbados on September 30, 2012. 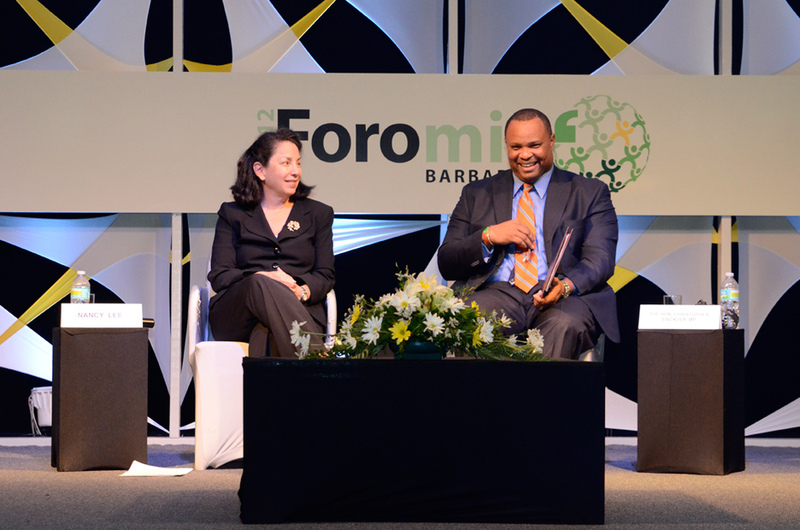 The Forum is an important knowledge-sharing venue for microfinance institutions in the Caribbean and discussions this year will cover issues such as the state of microfinance in the Region, responsible microfinance (i.e. client protection, etc.) and the Smart Campaign, the value of a Caribbean microfinance network as a mechanism for knowledge-sharing, and development of the microfinance industry. Individuals interested in attending can contact Villet Bennet at Villet.bennet@developmentoptionsja.com. The Caribbean Microfinance Forum is being held in conjunction with the Inter-American Forum on Microenterprise (FOROMIC) hosted by MIF/IDB on Oct. 1-3, 2012, in Barbados. The Citi Micro-entrepreneurship Awards for the Caribbean are financed by the Citi Foundation and administered by the Caribbean Microfinance Alliance (CMFA) and the MIF. The awards program has 3 goals: 1) to raise awareness about microfinance; 2) to build awareness about the important role microentrepreneurs play in their local economies; and 3) to develop the next generation of microfinance networks. Working at PRMR Inc., I have come to love the work that I do for the first time. Not only do I want to come to work in the morning but also I actually wake early enough to make breakfast and eat it before leaving home. This has never happened before.